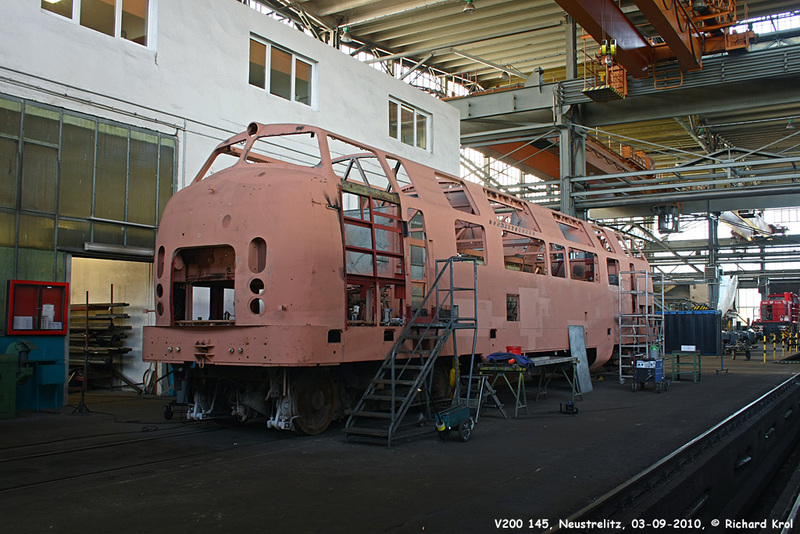 V200 015 was seen in Hattingen Ruhr. 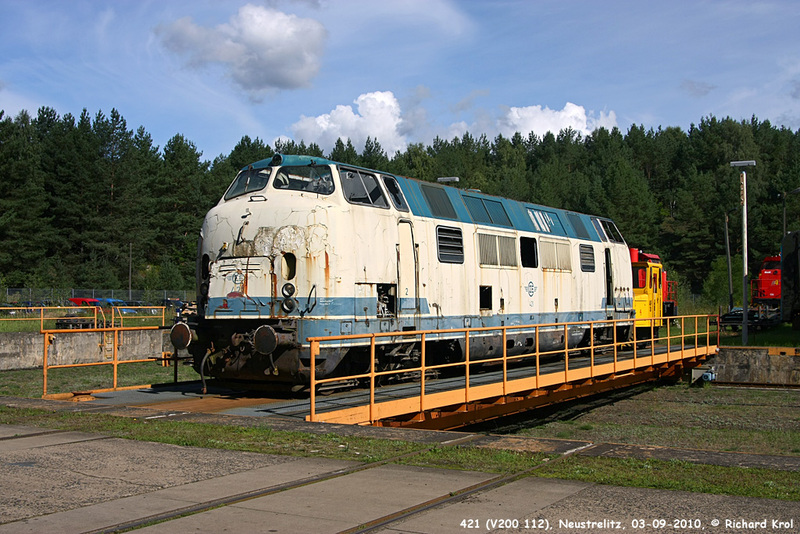 Reuschling will use parts of this locomotive to repair the transmission of the D9 (V200 053). The Brohltal-Eisenbahn GmbH (BEG) has acquired V200 015 (ex-SBB 18463) from GES and was today seen on transport from Kornwestheim to Brohl-Lützing pulled by 360 573. BEG will use the loco for spare parts for the defective D9 (V200 053). V270.10 is awaiting EBA approval before leaving the yard. Meanwhile they have started rebuilding V200 145. She has been emptied, sandlasted en primed. Now they are repairing the bad sheet metal. She will become the workshops own locomotive as V270.09 has been sold to the Knape Group. Already reconditioned parts from V200 127 will be used for the V200 145. It is to assume that V200 127 will not be restored as she was damaged by a fire back in Greece. The next locomotive to be restored will be V200 112. She was choosen from the 10 remaining for being the best candidate and was brought into the workshop. 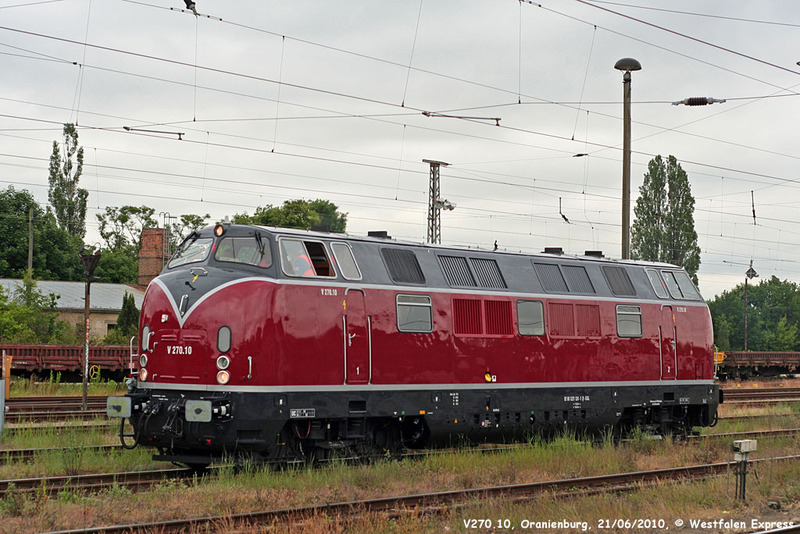 In a classic red livery V270.10 (ex V200 124) was seen in Oranienburg. The engine ran light from Neustrelitz to Oranienburg and back, so it was probably a test run. The locomotive is intended for SGL Schienen-Güter-Logistik GmbH which already have V270.09 (ex V200 121) and 221 136-5 in use. V200 007, which was put aside since January 15th 2005, received an overhaul by the Arriva Works in Neustrelitz and is back in service with a revision date June 1st 2010. 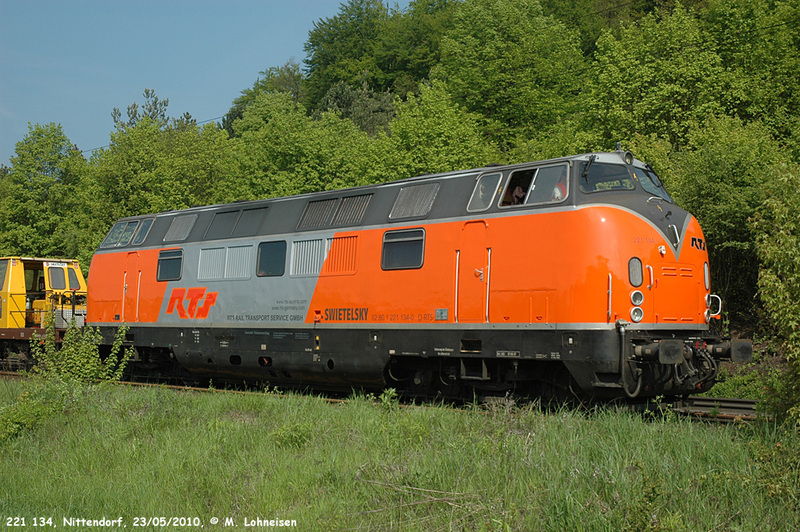 On April 8th Rail Transport Service GmbH (RTS) took over a part of the locomotive fleet and staff of the insolvent company EBW including the V200 105 (V270.08) and V200 134 (V270.07). A new look, colours and layout of the website was launched today. With this more modern look I hope that you will keep coming back to read the latest news, looking up information and hopefully to contribute too. The Knape Group (GSG Knape Gleissanierung GmbH) acquired both V270.09 (V270.121, ex V200 121) and V270.10 (ex V200 124). The company Schienen-Güter-Logistik GmbH(SGL) will use them (as they also have 221 136-5) for track maintenance trains.